Popular seats sell out fast. Buy Austrian Grand Prix tickets from these official retailers. Since being transformed on the drawing board of Herman Tilke, this stage for the Austrian Grand Prix has not only kept much of its character derived from the surrounding countryside, but it has that quality that every good Tilke design has in common: it lets the spectator enjoy views of multiple sections of the circuit from one of numerous vantage points. Spectators in the South West Grandstand experience dramatic views from a unique spot on the circuit. 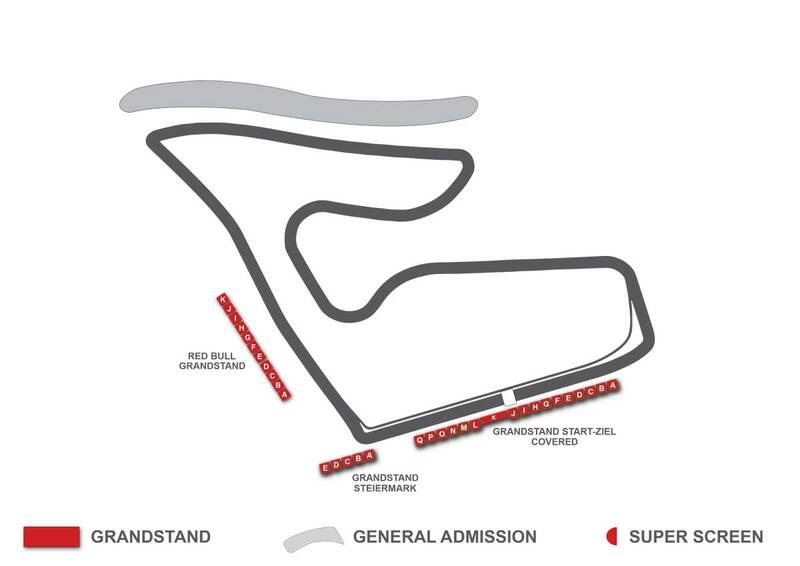 The grandstand is on the outside of turn one, and offers views down the main start/finish straight, as well as the straight that leads to turn 2. Its the ideal place for the start of the race – you’ll see the lights go out, and a whole field of F1 cars squeeze into the tight turn 1. You’ll also be close to the pitlane exit, have a distant view of the pitstops and be able to see the podium from your seat. The most popular grandstand at the Red Bull Ring and its easy to see why. The seats here offer a great scope, with a view of the racing that encompasses turns 1 and 2 and the straight between them, where overtaking is possible with a good run out of the first corner. As well as this there is a more distant but perfectly enjoyable view of the interior of the circuit. This includes the stretch from turn 3 to turn 6 before cars disappear towards the penultimate corner. The action is partially obstructed for parts of this section by grassy banks, but for such brief a time that you still get a sense of being able to follow the racing for its entirety. The scene is framed by magnificent local landscape and the ‘Bull of Spielberg’ statue that has become iconic since the circuit’s return. The cherry on the cake is a well placed giant screen opposite the grandstand which ensures you’ll never miss a beat. There are few F1 circuits where you can see so much of a single track from one vantage point, and at a traditional European venue its unheard of. This is where the circuit’s Herman Tilke redesign is most evident. The North (Nord) Grandstand is perched on the outside of turn 3 with head on views directly up the back straight. Its one of the more common overtaking areas on the track owing one of the circuit’s 2 DRS zones here. The backdrop is classic Austrian Grand Prix stuff, with the surrounding mountains and trees and to the left is the iconic Red Bull sculpture. Easy access to the adjacent general admission area makes up for what is a bit of a restricted view in so much as there is only one corner in sight. 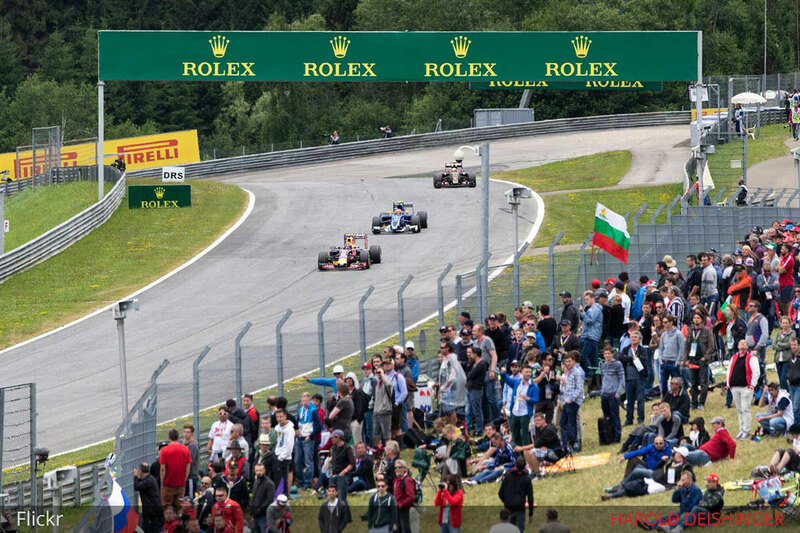 The Mitte Grandstand between turns 5 and 6 is a long established favourite at the Austrian Grand Prix. You couldn’t be disappointed by the views here; cars skirt around the grandstand in close proximity while beyond this there are views of the straight between turns 2 and 3 and the epic, uphill turn 3 itself is visible. With the huge Red Bull grandstand directly opposite, this area of the circuit is a perfect balance of atmosphere and track views, and ticket prices are usually somewhere on the good end of reasonable. The Red Bull Mobile Grandstand occupies a position beside the final two turns of the race track and offers a view of said corners, the pitlane entrance – and from certain points – a view up the start finish straight, the grid and turn one a speck in the distance. You’re close to the pit buildings and the grid but if you’ve come to bask in the gloriousness of the Styrian mountain scenery this place can leave you cold. Best experienced as a multi-grandstand ticket that allows access to a number of stands over the weekend. 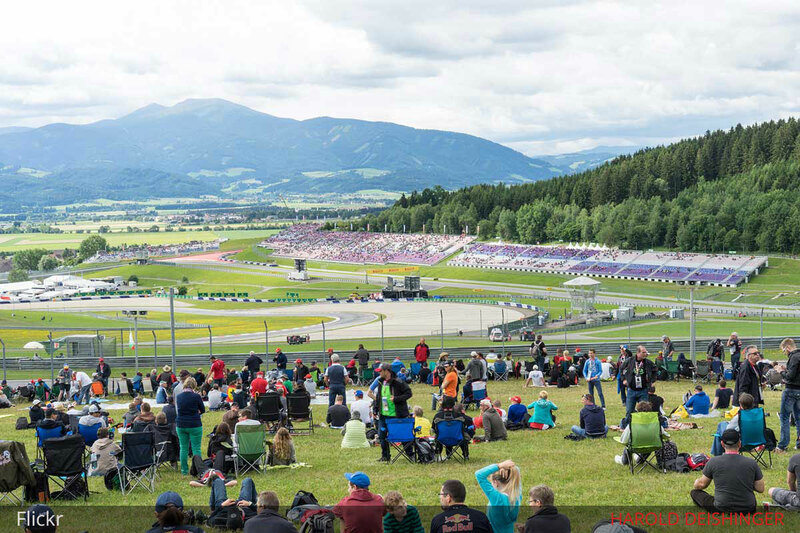 The Austrian Grand Prix is such a special setting that there’s a lot to be said just for being there and taking in the atmosphere and sound of F1 cars, rebounding off the surrounding hills. General admission offers exactly that at the lowest price point, and allows access to the elevated banking that stretches along the back straight of the circuit. Superscreens are plentiful so you won’t feel out of the loop and if you get bored where you are there’s always a fresh view not far away. Bring good sturdy walking shoes for scrambling up those grassy banks and something to sit on.